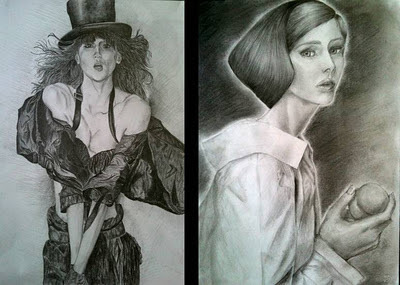 In this course, students were exposed to Black/White rendering techniques using media such as charcoal, pastel, pencils and markers. They worked on varied subjects for their classwork which include manmade objects, human study, nature, landscape and architecture. Rex Ray - His Prints! Copyright © 2006 - 2014 Lau Sheow Tong. He is the founder of Composite Art & Design who has an extensive track record in Art education, having taught at primary, secondary and tertiary levels. Under Composite Art & Design, Trigger Creations is its series of Art Educational Programmes (NAC-AEP) targeted for MOE schools as endorsed by National Arts Council (NAC). Other various Art and Design courses could be customised and tailored according to school's needs. Primary courses could also be funded under AMIS (Art and Music Instructor Scheme) as officiated by MOE. Currently he is also lecturing at Temasek Polytechnic (Design Integrated Studies) and First Media Design School on part-time and consultation bases for various design modules. As a teachers’ trainer with World Prime Arts Education, he has also conducted various Art workshops specially tailored for teachers from MOE such as Art Interpretation for Study of Visual Arts, Fashion Illustration and Mixed Media Painting. As a practicing Artist, he has exhibited his work at prominent local galleries such as Utterly Art (‘Lucky Cat’ in 2007, ‘Fantasy of Luck’ in 2008) and Sunjin (‘Emerging Talents: 5 Artists for the Future’ in 2007, ‘Sweetalicious’ in 2008). He holds a Master in Fine Arts from LaSalle College of the Arts (validated by Open University, UK), a Post-graduate Diploma in Education from National Institute of Education and a Bachelor in Arts from National University of Singapore.